My last competition was the World Clubs Cup where I went 3-1. Since then, I have been able to get very solid comprehensive training cycle. My training took place in 4 locations: (1) State College, PA with the Nittany Lion Wrestling Club, (2) Illinois while visiting my wife's family, (3) California at the Treigning Lab - http://www.treigninglab.com/ -, and (4) at the Olympic Training Center in Colorado Springs, CO. Many may not know that I suffered from back issues and lifting was difficult for me for most of my career. Since transitioning to 86kg, I have integrated many lifting phases, nutritional adjustments, and lifestyle changes with coach Sam Calavitta and the Treigning Lab. 1 year ago, I was not able to do a squat due to lingering back problems. During this strength Phase I was able to reach incredible 1 rep maxes in Squat (405), incline bench(315), and weighted pull up (150). The Calavitta family has been extremely supportive and helpful during my transition to 86kg. Sam Calavitta (coach Cal) and I speak on the phone weekly and formulate specific lifting and training plans to peak for events. The main goal of this phase was to hit the 1 rep maxes before my national team training camp. This would not only allow for recovery for national team camp, this trip to Paris, but most importantly the World Cup in February. I am extremely excited to compete! The rule of thumb when traveling to compete internationally is to give yourself a day of time zone adjustment for every hour your destination is ahead or behind of your training time zone. I compete in Paris, France on the 29th - https://unitedworldwrestling.org/event/paris-tournament-0 . Paris is 6 hours ahead of Pennsylvania, so we were scheduled to arrive in Paris on Monday the 23rd. However, Nico Megaludis and I were canceled out of State College on the 22nd , and had to drive to Williamsport about 1 hour 15 min drive away from State College, Pa. In Williamsport, we were delayed another 2 hours and missed our connecting flight from Philadelphia, Pa to Paris, France. Eventually, we made a connecting flight in Philadelphia and arrived in Paris. When I travel, I am all about extreme comfort and recovery. Traveling can be very taxing on your body. Whether your travel is a few hour bus/car ride or a multi hour flight, it's important to know your body, your fatigue level, and recovery protocol. I like to pick out my most comfortable or favorite articles of clothing starting with my shoes, socks, compression gear, sweatpants (I prefer joggers), shorts, t shirt, qtr zip or sweatshirt, headphones, and neck pillow. When packing, I specifically lay out what I want to wear so I don't forget anything. My travel attire consists of Adidas, Lululemon, and Scrap Life - http://www.scraplife.com/. The plane or bus may be cold or it may be hot, so I like to prepare for both which is why I like to throw the shorts or joggers into my backpack and where the other on the plane. Compression is optional, however I have noticed a big difference since implementing them when I travel. There are a lot of option out there for compression, but I like the company Skins. They are expensive, but worth the investment due to their technology to help with recovery. When traveling long distances, your body and feet will swell. The compression socks will go up mid calf and will greatly reduce swelling, increase circulation, and minimize muscle soreness. If you want to take your compression and recovery to the next level, the Skins RY400 recovery tight will help reduce Delayed Onset Muscle Soreness (DOMs). When traveling domestic or flights under 3 hours, I will only wear the compression socks. When traveling overseas, I will double up and wear both the socks and tights. My wife hates when I pack, because, for me, packing consists of a long ordeal in which I pull out every article clothing I think I may need for my trip and a lay it on the bed. Next, I go through and pick out which shoes, socks, singlets, briefs, shorts, sweats, and shirts that I will wear on competition days. 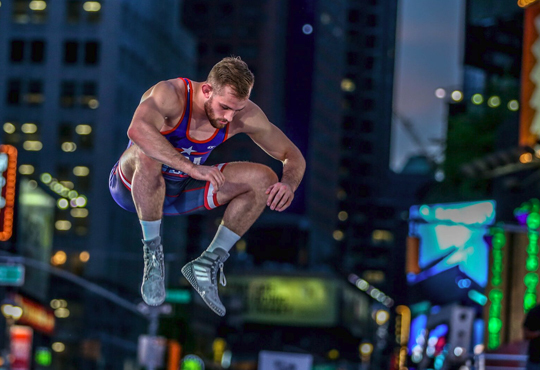 For this trip, it will be white Adidas Tech Fall wrestling shoes, Red White and Blue Adidas Socks, blue Cliff Keen Briefs, and Adidas wrestling singlets. These articles stay separate and I don't use them for training purpose. For me, it's a mental thing. It separates training from competing. Next I lay out workout clothes for each day I will be training. I think in my head “ shoes, socks, briefs, singlet/shorts, and shirt.” That way I know I will have everything I need for my trip. If you're cutting weight, make sure to throw in your joggers , long sleeve shirts, sweatshirts, and any other things needed like jump rope, etc. One important tip: I make sure to have my competition clothes with me as carry on. If my luggage gets lost I’m still prepared step on the mat.